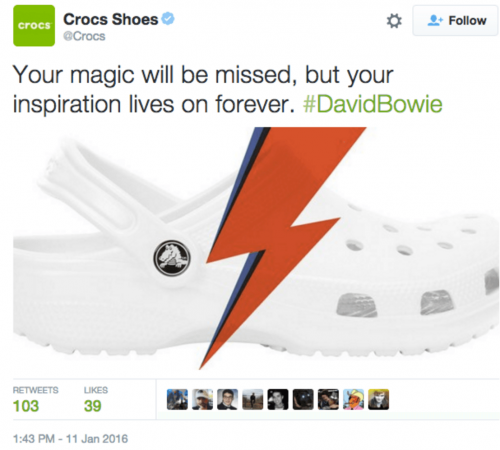 When David Bowie died last week (and by the way, f*ck cancer) companies hither and yon decided to hitch their social media exposure and engagement wagons to Ziggy Stardurst, thinking that the strategy of “riding the hashtag” gave them license to use a person’s death as suitable fodder for social content. Many of these posts were either commercials wrapped in the false cloak of tribute, or the companies doing the posting were so far removed from anything to do with Bowie and his work that it felt disingenuous. The most egregious was this hastily-deleted tweet from Crocs, which somehow managed to accrue more than 100 retweets and three dozen likes before being pulled. Evidently the Venn diagram of people who love both hideous footwear made from a 3D printer AND David Bowie includes at least 100 persons in the overlapping center. Most people agreed with my point, some did not. 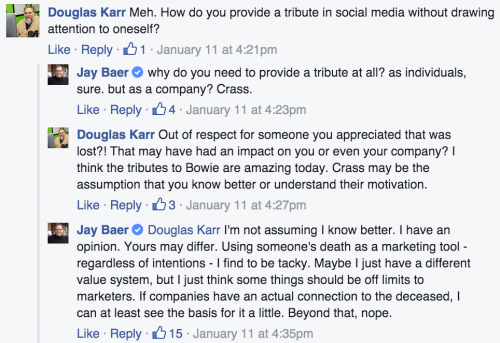 Combined with Paris and other recent events, this exchange with Doug and the whole Bowie scenario got me thinking about social media, and death, and tragedy. And even though I was pilloried on my own Facebook page for trying to “make the rules” for social media practitioners, I’m going to do just that right here. These rules govern scenarios that play out in western cultures, primarily North America. Other parts of the world have different rules, and you should seek to understand them if your company is active there. And speaking of companies, let me reiterate that these rules are only for businesses. Individuals should do whatever they want to do. You are a person and you do not have a “brand” or shareholders that you need to worry about. So do whatever makes you feel better during dark times. For purposes of these rules, I define a tragedy as any horrific occurrence significant enough that television interrupts regular programming to go live with a story, and stay with that story. I do see the irony of using old media behaviors to govern new media behaviors, but I’ll take my severity cues from CBS and their brethren long before I use trending topics as a guide. So, if TV is wall-to-wall talking about something terrible, do not post. Certainly, stop all automated posts (I have accidentally fallen into this trap myself and now I immediately put everything on pause). Then, resist the temptation to say anything at all. Do not post from the brand that “our hearts and prayers are with the survivors” (or similar). The only exception is if the events occurred in a city/state/region where your brand is based, and that fact is widely known. For example, it would be acceptable for Anheuser-Busch to post about a tragedy in St. Louis. (Yes I realize the brand is now based overseas, but it’s ancestral home is known to be St. Louis by most people). Even in that scenario, do not post “thoughts and prayers” while the crisis is still unfolding. Nobody needs to be comforted by a company. That’s not what companies do and not what companies are for. People provide comfort, not companies. If you had a relationship, a tribute is relevant. If you didn’t, it isn’t. “A cup of coffee is not saddened.” EXACTLY. If, in the wake of tragedy or demise, you feel the need to include a photo of your product or location, or feel even the slightest urge to use multiple hashtags so that your post will be seen by a broader audience than your current fans and followers, I implore you to resist those cravings. Ultimately, Peter Shankman said this best after the Boston Marathon when he wrote on Facebook, “”No company ever went broke because they opted to shut up for 24 hours.” But if you simply MUST say something, do not commercialize it. The Columbia Records tweet above is a good example of a relevant remembrance delivered without commercial intent. They could have EASILY included photos in that tweet of every Bowie album they ever released. But they didn’t, because doing so would have been crass and broken the rule of making it about them, and not about you. Certainly, if this has been a Buffalo Wild Wings or Hooters or TGI Friday’s it would have been even more tacky. 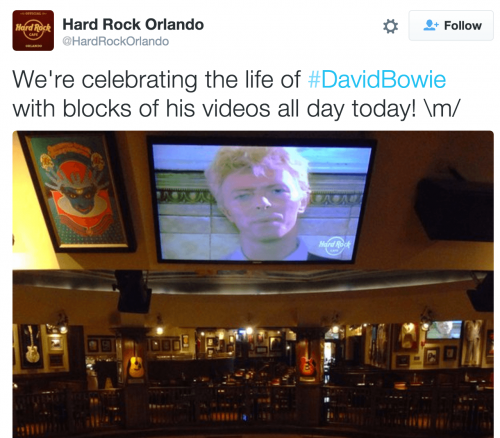 At least Hard Rock has the music angle to lean on with regard to David Bowie. So it’s not terrible, but it still focuses on what THEY are doing (playing videos) and combined with the photo, serves as a subtle suggestion that maybe YOU should come on down for a burger to celebrate Bowie with kindred spirits. Plus, using the hashtag is a bit too cheeky for good taste, in my estimation. Social media for business isn’t easy. You’re supposed to be fast, inoffensive, and worthy of attention while still generating the clicks and other engagement your masters demand. And with all the channel proliferation and organic reach squeeze, it’s just getting harder. But don’t make it harder than it needs to be. In times of grief and crisis, when in doubt, say nothing. And if you have to say something, stay classy. 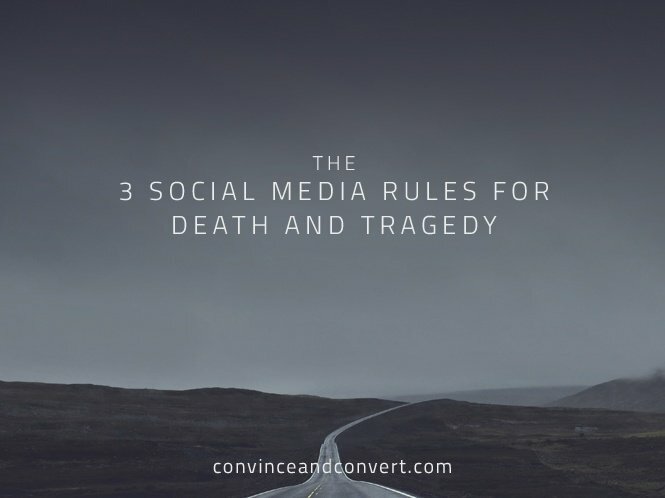 I hope you found value in these 3 social media rules for death and tragedy. But I’m certain some of you will disagree. Have at it in the comments below.